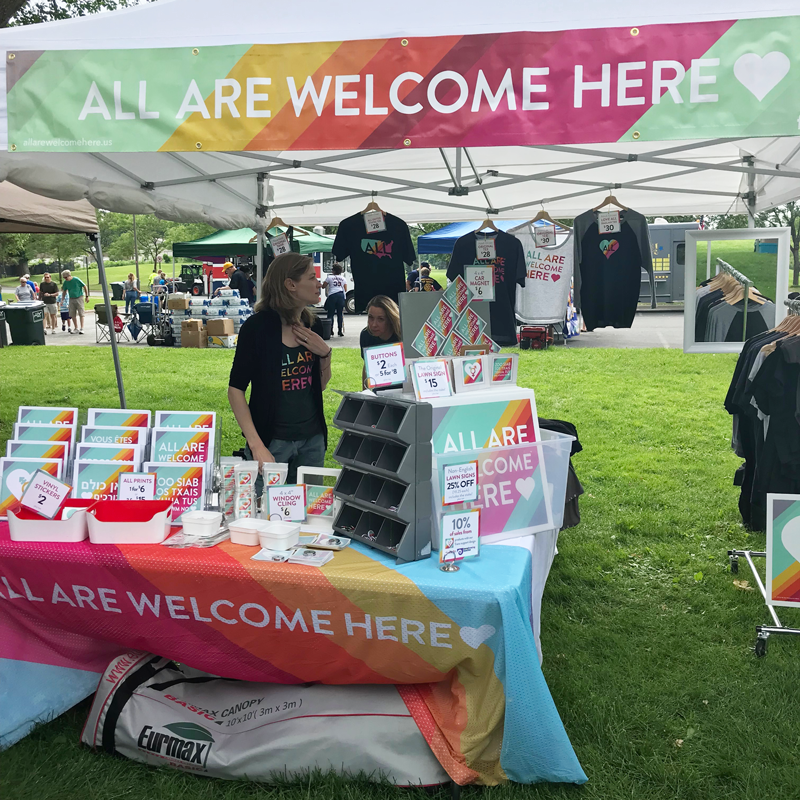 This review takes a look at three different PRIDE events I attended in the Twin Cities area of Minnesota. Remember, all events are different and not every event is for everyone (just like some people like sports events, some people like theatre, some people like camping, and such). You might not feel comfortable at some events but many are family friendly. I hope this post shines a light on the diverse opportunities and events that take place during PRIDE in the Twin Cities and around the country, and hopefully in the future you will attend an event that feels right for you. This blog post is written from my cisgender straight white female perspective for those who have never attended a PRIDE event or those considering attending their first PRIDE event. The Golden Valley PRIDE Festival was held on June 10, 2018 and is a wonderful family friendly event with food and lots of wonderful music. There were also lots of booths and vendors with all kinds of LGBTQ+ support information. It is a great environment to come learn something new and the shuttle parking from the local Methodist church is really convenient. One of the performances was by the Twin Cities Gay Mens Chorus and they were fabulous! There were all sorts of vendors at the festival. 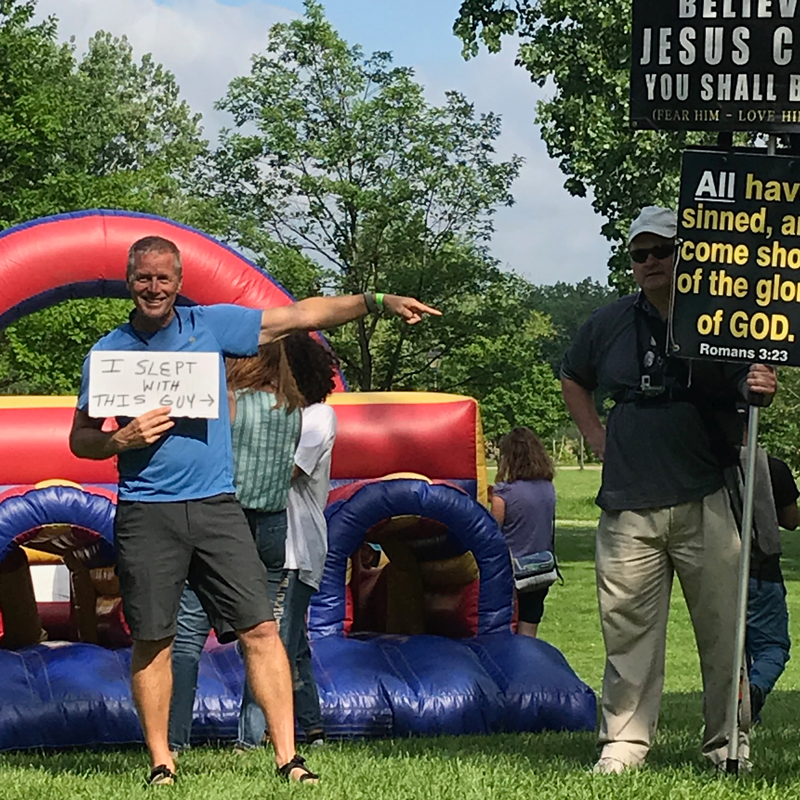 There was only one protester at the event. He wore a body cam hoping to get into an altercation possibly for a blog post or a lawsuit. But all he got was made fun of. Because those who throw mud tend to lose ground! 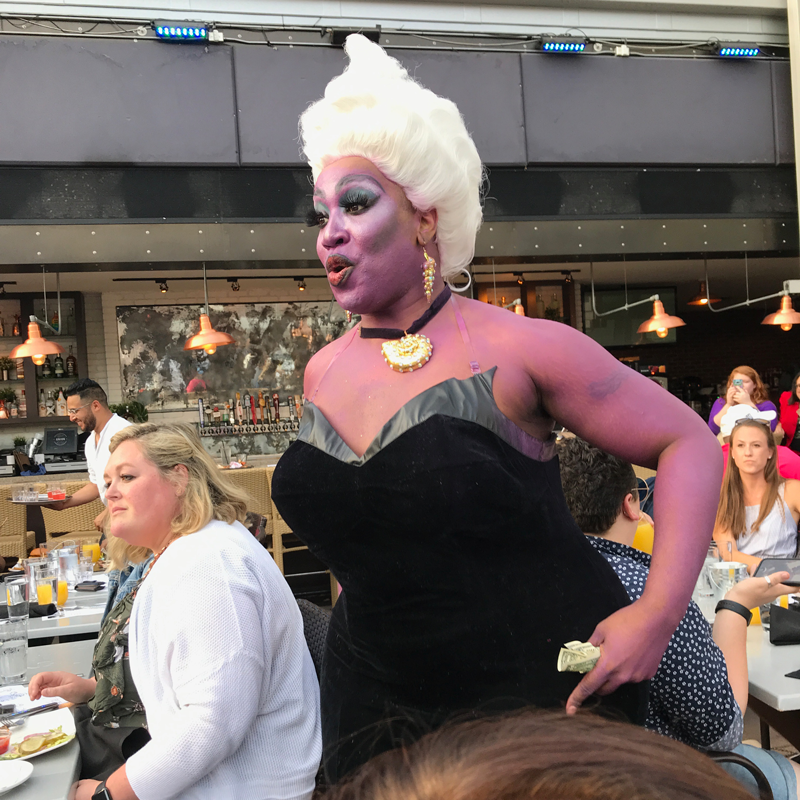 I love drag and I love Disney, so this combination is a win/win in my world. 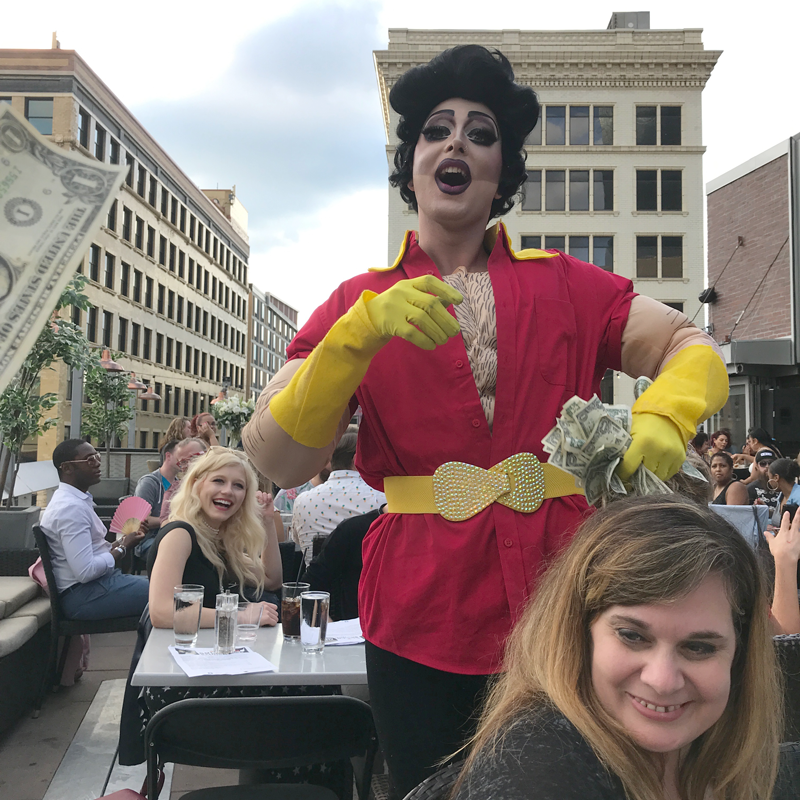 Flip Phone events puts on great drag events around the Twin Cities and this is a great adult night out. The show is all-ages but there is drinking and adult content/language. These events capitalize on nostalgia and pop culture fandoms in a way other Twin Cities arts communities haven't taken advantage of (the only fandom that is universally agreed upon as allowable to create tribute art to in the Twin Cities is Prince). While they keep putting on shows, we will keep coming. And be sure to check out a show featuring Nocturna Leemission, she is my favorite Drag Queen, and her performances are always over-the-top creative. Julia Starr rockin' the Yzma from the Emperor's New Groove. 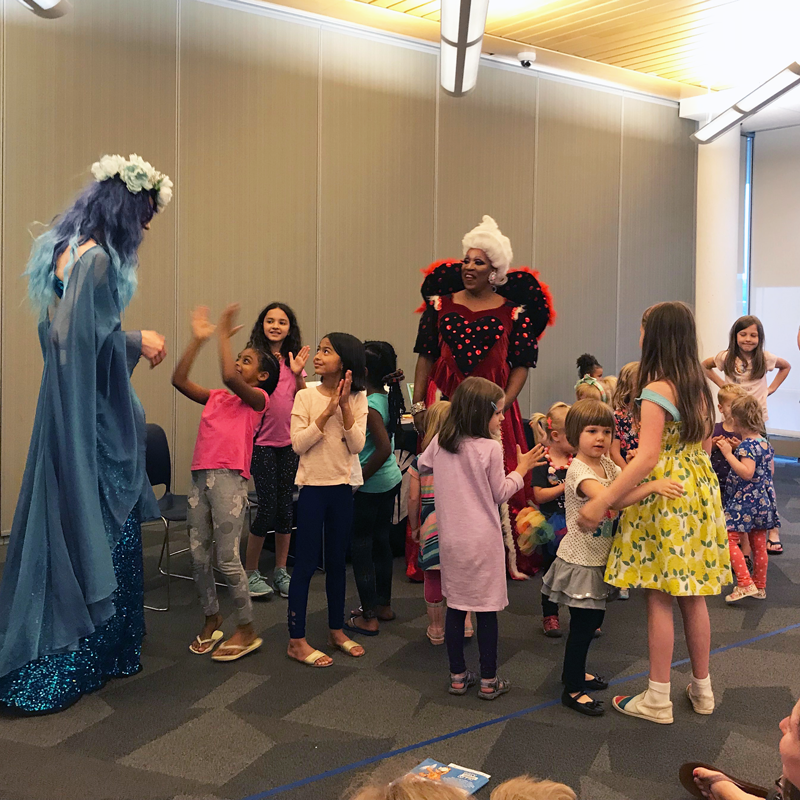 Around the country, libraries are putting on Drag Story hours for children as a safe environment to show children acceptance and love for individuality. 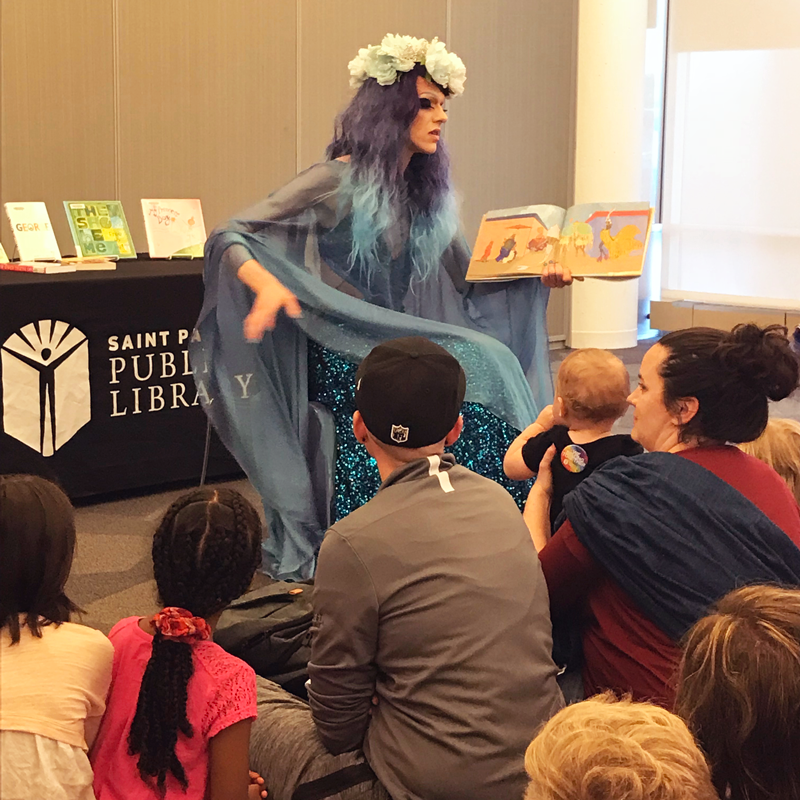 The story hour at the Saint Paul Public Library was such a wonderful event I still have goosebumps. The children were so happy and the performers were amazing. Just look at all the fun everyone had! I wish I had an event like this when I was growing up. Most of my information and understanding of the LGBTQ+ community I learned from those around me was assumptions and rhetoric not based on any actual experience. This environment breaks down stereotypes and I can't say enough about how impactful the experience was. 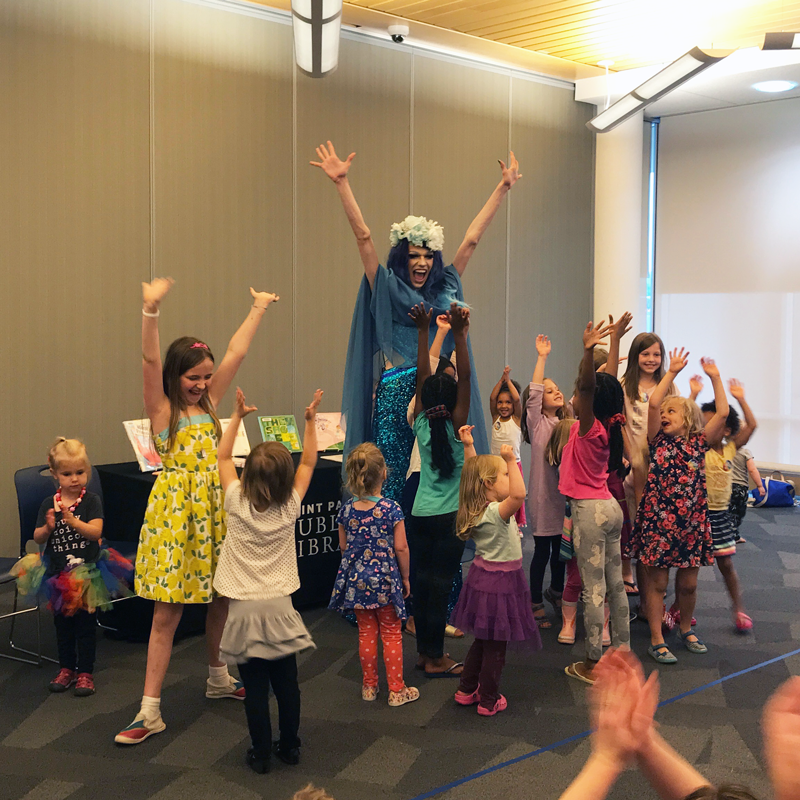 The kiddos even got to get their pictures taken with the queens and make their very own crowns after the story hour! 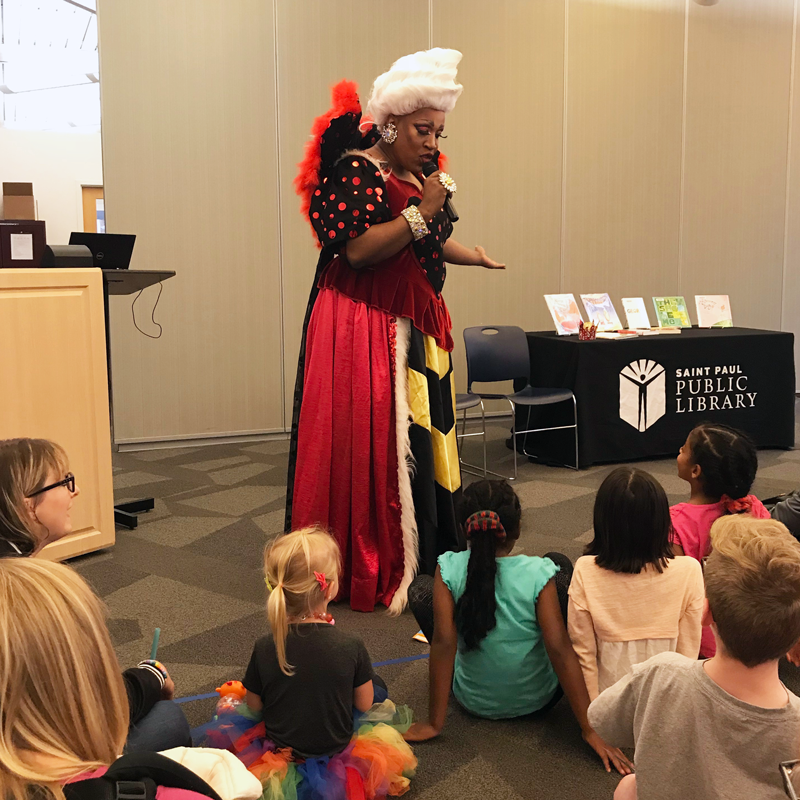 CLICK HERE to see the live stream of the story hour on Facebook at Rondo Community Library. Photo fit for a queen! 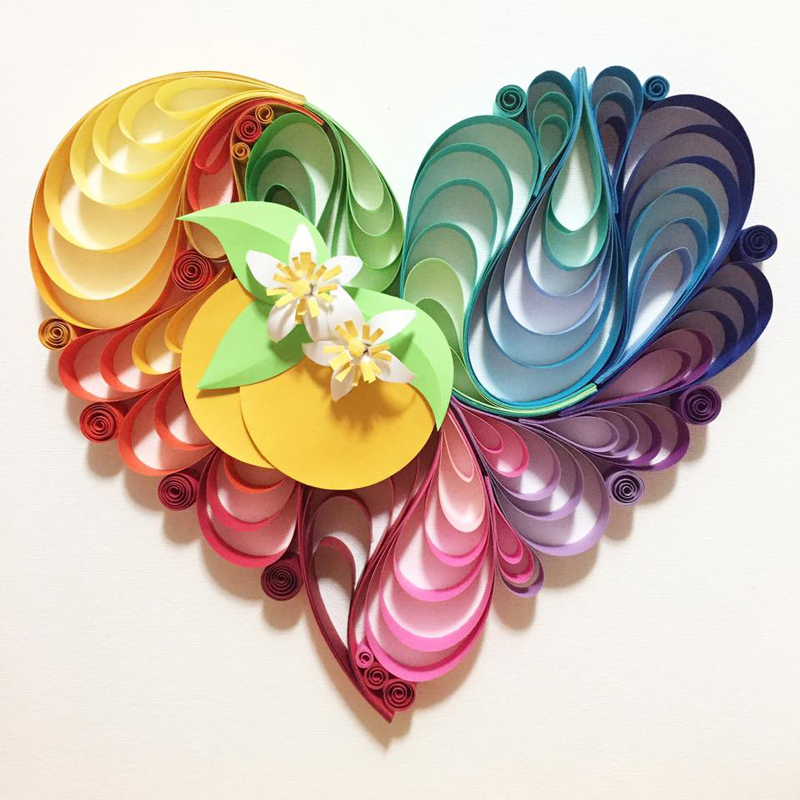 I hope this blog showcased some amazing events and I challenge us all to take an active role in PRIDE month this year and do something outside of your comfort zone. You can read about an LGBTQ+ topic or experiences (congrats you just did that), share information with those you love, tell those you love that you support them no matter what, donate to an LGBTQ+ charity, or be an ally online and/or attend an event. Whatever you do, remember it takes active effort to change and to move forward and to do better. I have many people in my life that find this topic uncomfortable and wish PRIDE wasn't so 'in your face' (their words, not mine). But every time we showcase what PRIDE is really about, that is one more chance for people to learn something new, become more accepting of others, and do better. June 12th is the 2nd anniversary of the shooting at PULSE Nightclub that took the lives of 49 innocent people. This cowardly and senseless act was committed specifically against the LGBTQ+ community. I dedicate this blog in their memory and as a promise to always try do better and to help other's do better too.